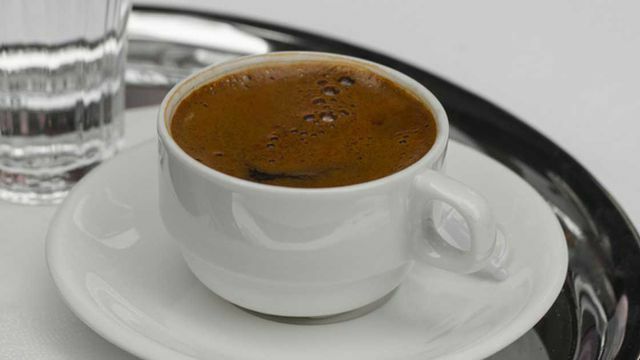 For those who haven’t tried it yet, Lebanese Coffee (aka Ahweh, Kawha, Kahva) is very similar to Turkish Coffee and it’s one of the strongest coffees you can have. It is as strong as an espresso, if not more. And once you take a look at its preparation method you’ll know why. It is typically served in small nicely decorated shots that are the size of espresso shots. This coffee is usually served in small “shots” the size of espresso coffee cups and it’s usually prepared 3-5 “shots” at a time. For each “shot” you want to make measure 1.5 times that in water and add 1 teaspoon of very finely ground coffee (Turkish grind). Method 1: As soon as you have poured the coffee into the boiling water and stirred it, it’s ready. Turn off the stove and let the coffee pot rest for 3-5 minutes before serving. In this style the coffee will contain some foam. Method 2: As soon as you have poured the coffee into the boiling water, lower the heat, stirr the coffee in, and hold the pot close but not right on top of the fire and then bring the coffee to a boil 3 successive times , without letting it overflow (overflowing can happen quickly so be careful). In this method you’re basically getting rid of the foam by allowing the coffee to come to a boil 3 times. Once done boiling it, turn off the stove and let it rest for 3-5 minutes and then serve it. This is the method my mom uses often but feel free to experiment with the other method as well. – The above recipe is for strong coffee. If you like your coffee lighter, or if you are not used to strong espresso-like coffee, you can use half a teaspoon for each 1.5 water shots. – Try adding a pinch of Cardamon spice. Either buy your coffee with cardamon mixed in, or while boiling the water add a very tiny bit of powder cardamon to the pot (1/8 th of a teaspoon). This will give it a beautiful aroma and flavor. – You can try adding 2-3 drops of cold water to the coffee pot as soon as you remove it from the stove and then cover it with a small plate while you wait for it to rest. I don’t know what it is but the temperature shock that the cold water droplets bring seem to do something that alters the aroma a bit. – This is a matter of taste, but our favorite Lebanese coffee brand is Cafe Najjar which is imported from Lebanon. You can find it in many US Middle Eastern grocery stores as it’s a popular brand. You can also buy it online, just search for “najjar coffee” and you’ll find this brand below.